Two Cammodel Bonuses In 1 Week! It’s time for a new contest! Streamate just announced the July Best Face Forward Contest starting on Sunday July, 22nd (GMT). All Streamatemodels who work throughout the week are eligible to win cash prizes until July 28th. It’s a week long Best Face Forward contest where even cammodels who may not place in the top 200 can still win a bonus prize. Just like the last bonus contest Streamate decided to change things up a bit giving models more time to pace themselves instead of participating in a two day long camathon. During the week-long event, all performers will have a chance to earn a special bonus gift! You must stream for at least 25 hours during July 22-July 28th (GMT). If you stream 25 hours and earn at least $1000, you’ll get a $100 bonus! All performers are eligible to earn one of these gifts, including performers in the top 200 ranking! Make sure you stream at least 25 hours throughout the week to qualify. 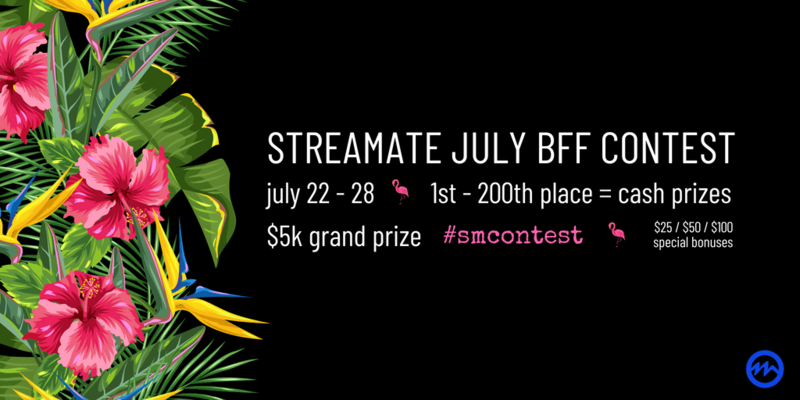 Streamate July Best Face Forward #SMCONTEST is headed your way! And of course if you’re a Streamatemodel in the Boleyn Models Daily Pay Program then you are also eligible for our weekly cammodel bonus. This is something we offer for cammers in our network who have chosen to become cammodels on Streamate and work a 6 day week to qualify. We understand that this may not be a viable option for all cammers, but many have taken advantage of this opportunity when interested in raising additional money. Even when you set a minimum schedule of four hours per day, you can essentially earn free daily pay with us and have your second lowest day doubled at the end of the week. That’s how the Boleyn Models bonus works! For more information on joining Streamate and how to signup please read our Streamate Daily Pay FAQ article found here on our website.